I love filming collabs with my friends, but after a while you inevitably run out of challenges, so me and Sian from ReadersRambles decided to create our own - Fictional Scattegories! The idea of Scattegories is to roll the dice to select a letter, and then answer twelve questions all starting with that letter. Sounds simple, but it really isn't! There are official Scattegories rules which do differ slightly from our game, so feel free to adjust the rules to suit your own game - just keep it consistant. Each game of Scattegories consists of three rounds, which we have prepared already for you to use. Feel free to adjust any of the questions for your own challenge, these are just ones we came up with for our game. Roll the dice to select your letter. If you've already had that letter in a previous round, roll again. Time the round for four minutes. Answers must begin with the letter rolled on the Scattegories dice. Articles A/An/The do not fulfill the letter requirement, so titles such as The Little Mermaid, The Walking Dead, would be used for letters L and W. (This makes A & T a very difficult letter!). Players cannot use the same answer twice in one round, so while Voldemort could be at Hogwarts, a Villain, and a character that kills - you may only use him once, choose wisely. Last names can be used first, if that character is known/spoken to by their last name. I.e, Potter, Snape from Harry Potter, Barrons from the Fever Series are acceptable, however characters who are never referred to/or known by their last name are not. Get creative with your answers, but be prepared for other players to challenge you. For "Things at Hogwarts", saying a pupil/teacher name/common room/wand/a specific potion or charm is thinking outside the box, but if you say a chair, or a bed - that's pushing it too far. You can be as strict as you want, but remember to be consistant throughout the game. You can select up to three answers per category, so for example for female characters beginning with H, you could have Hermione Granger, Helga Hufflepuff (which would earn you two points!) and Holly Kennedy from P.S I Love You. When the time runs out - stop writing and compare your answers. Go through your answers by category, crossing out any duplicates you have with other players on that category. Add up your total points for each round, and then see who wins! Players take turns reading their lists. Cross out any answers that matched another player’s. Players score one point for each answer not crossed out. As mentioned before, creative answers are allowed, but any player has the option of challenging an answer. If an answer is challenged, all players, including the player whose answer is being challenged, vote on the acceptability. Majority rules. In the event of a tie, the vote of the challenged player does not count. The player with the highest score wins the game. In the event of a tie, the tied players play a tie-breaker round. 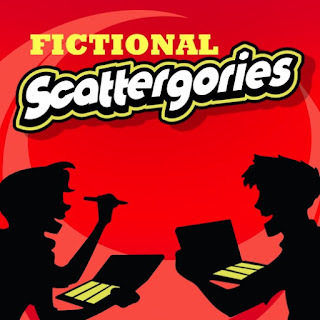 Have you played our Fictional Scattegories? Comment below! Somehow we're halfway through November already, which means it's the perfect time to start thinking about Christmas gifts. I absolutely love shopping for my friends and family during the festive season, so I've teamed up with a few UK based shops to help make your shopping that little bit easier, and give you some discount codes as well. All the shops I have worked with on creating this gift guide are very affordable, so I really encourage you to take a look around their shops. Check out the video gift guide here! Oh how I adore this shop - Rosie Lea Tea is a small family business based in Broadstairs in Kent, and they specialise in high quality artisan loose leaf tea. Rosie Lea creates hand blended, unique tea recipes that take inspiration from literary favourites, television shows and fandoms. I absolutely adore these because they make such lovely stocking fillers, and a truly lovely gift for someone who has a favourite author, book or fandom. My favourite item? Probably their fandom teas, the Dean inspired Supernatural tea is a green tea flavoured with cherries and rhubarb - lush! And if you are buying for a lover of classics, their Jane Austen Teas are the perfect gift! Based in Dundee, Scotland, Jilly Jilly creates beautiful gifts designed with a smile in mind. Run by a team of two (and a quarter if you count their dog Daisy!) Jilly and David design and create lovely gifts that help you enjoy the little things in life. Everything in their shop is absolutely stunning, they create mugs, mirrors, earrings, notebooks, prints and so much more. I could lose myself in their shop for hours, everything is beautiful, feminine and just so, so cute. My favourite thing about Jilly Jilly is their attention to detail when it comes to their packaging, if you're looking to send a gift direct I thoroughly recommend this shop. Free UK Shipping on orders over £30. Based in Woodbridge, Suffolk, Tiny Zen Co creates funny and inspiring gifts, art and home decor. If you want to give a gift with a personal touch, Tiny Zen is the shop for you. Cat lover? Book lover? Daydreamer? No problem. I absolutely adore their bookish gifts, and their "Just One More Chapter" is my absolute favourite. The beauty of this shop is that their designs can be purchased on mugs, tote bags and cushions. If you also speak fluent sarcasm, and need some time to introvert, you'll adore this shop. Buy: TinyZenDesign on Etsy Use code BOOKLIFE10 for a 10% discount! Literary Emporium is one of those shops you could lose yourself in for hours, they create book inspired gifts, jewellery, stationary and apparel. Combining a love of literature with and a fondness for handmade crafts, Literary Emporium is like a treasure cove for all things bookish. My favourite things about this shop are the huge range, the quality and the affordability. This is the perfect shop if you're looking for some little gifts or stocking fillers. Buy: Literary Emporium on Etsy - Use discount code "BOOKLIFE15" to get 15% off all orders until December 31st 2017. A small family run business, based in a market town in the gateway of Wales, DreamscapeInk specialises in creating quirky unique gifts that are affordable without compromising on quality. Whether you're looking for little stocking fillers, Secret Santa gifts, or a gift to make someone smile, DreamscapeInk have an amazing range of products. Their coasters are adorable, so colourful and fun, and at £3.50 each they are such a bargain. My personal favourite? This Grim Teacup Set. I can't even explain how much I adore this! (Please note - the Grim teacup set is decorative use only). Buy: Dreamscape Ink on Etsy. Use the code BOOKLIFE for 10% off. There's also currently a sale going on in their Etsy shop! 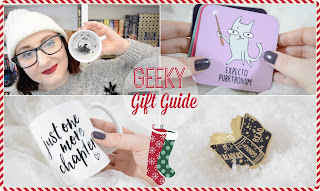 I hope you guys enjoyed this gift guide, let me know what your favourite items are in the comments! 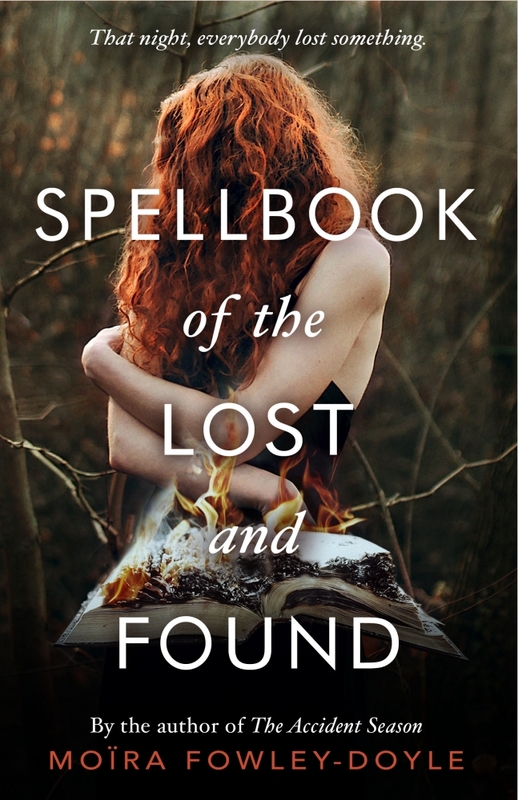 I picked up Spellbook of the Lost and Found at YALC (the Young Adult Literature Convention) earlier this year and although the cover got my attention, it was the blurb that pulled me in. 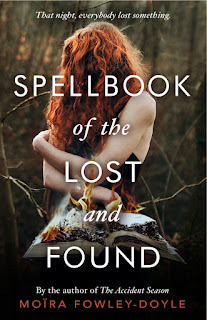 Ever since reading The Graces by Laure Eve (video review here) I've been desperate for another witchy read, and I've heard really good things about this one. With the cold nights drawing in, Halloween feels like the perfect time to pick this book up. Tea, cosy socks and chocolate not obligatory, but I'm definitely encouraging it. The readalong will run from Thursday Oct 26th (starting at midnight in your timezone, wherever you may be!) and will finish on Wednesday November 1st (ending at 11.59pm). Make sure to check out the goodreads group where we will be having discussions about the book throughout the readalong. Are you joining in with the readalong? If you post a video, blog post or image on Instagram about the readalong, please leave your links down below! A video announcement with more information will be up on my channel The Book Life soon! 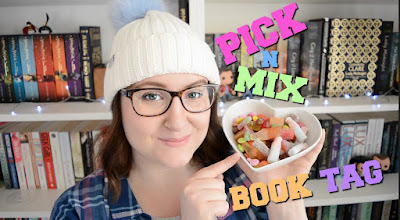 Pick n Mix Book Tag! 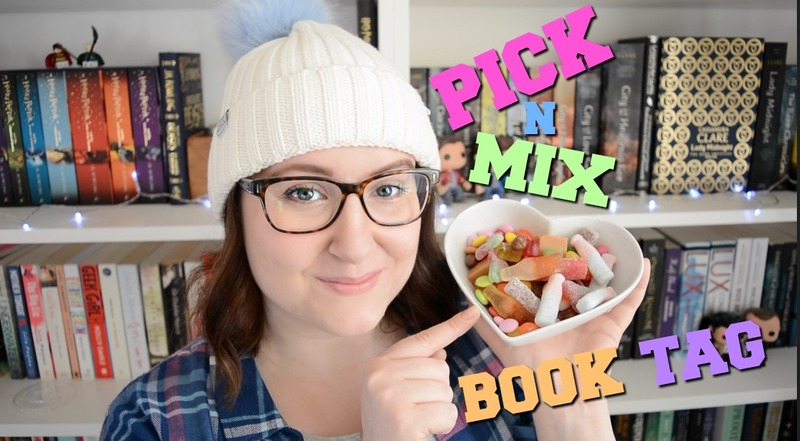 It's been a while (literally, years) since I created a book tag so today I am here to bring you the Pick N Mix Book Tag! Whether you are a blogger, Booktuber or want to answer these questions on Instagram, I would love to see them! 1. Fizzy Blue Bottles. They look strange, and they taste strange, but you like them. Name a book or series with a really strange plot that you couldn't help but love. 2. The Metre. It goes on forever. Name the longest book series you have read. 3. Chocolate Raisins. No amount of chocolate can hide what's inside. Name a book with a disappointing cover but an interesting story. 5. Hard Gums. You take a bite, but almost break your teeth. Which book or series was really difficult to get into? 6. Cola Bottles. Some are sweet, some are sour. Name two similar books, one that you loved and one that you didn't like. 7. Fried Eggs. Some people love them, some people hate them. Others feel quite indifferent to them. Pick a book that matches how you feel about fried eggs. 8. Smarties. No matter what you do, they're everywhere. Name a trend or trope you are tired of reading. 9. Gummy Bears. Name your favourite fictional creature or animal. 10. Pick n Mix! So many sweets, so much variety. 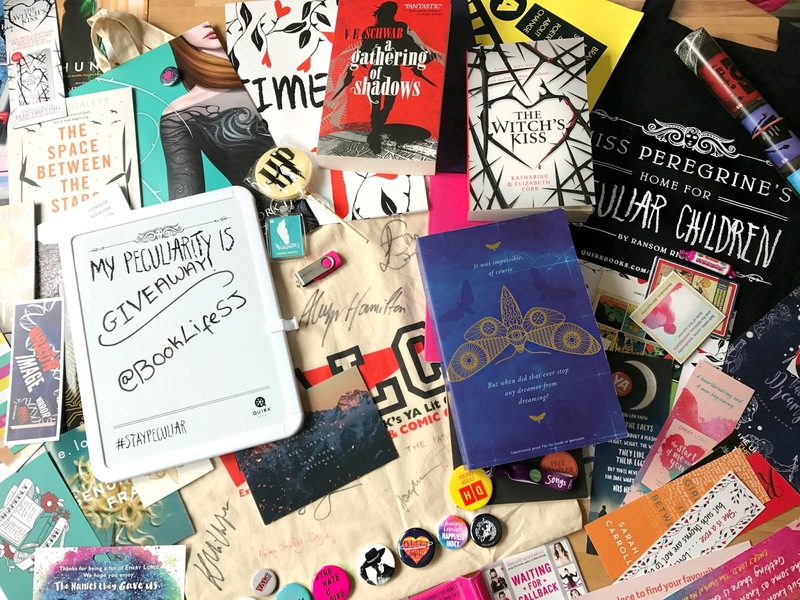 Name one/some of your favourite diverse books! If you have done the tag, whether it's on Booktube or a blog, please feel free to leave your links below in the comments so people can go check them out! Thank you!